We offer a wide range of high-quality goods of powdered eggs. 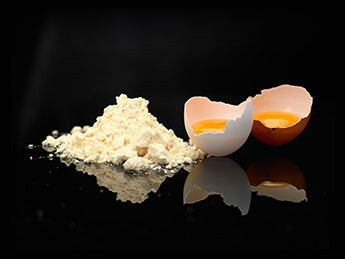 Egg Yolk Powder is a product obtained in the process of separation and drying of specially selected eggs. Ideal for baking bread, cakes, pasta products, creams and puddings. Hen Egg Yolk Powder Heat-Stable is a product obtained in the process of separation and drying of specially selected eggs. It has an increased thermal stability. Ideal for baking bread, cakes, pasta products, creams and puddings. Albumen Powder was obtained by elimination of glucose, drying the liquid protein of chicken egg and pasteurization. It is used primarily in the production of confectionery, ready-made food and meat industries. Foamy Albumen Powder foamy was obtained by elimination of glucose, drying the liquid protein of chicken egg and pasteurization. This product is characterized by significantly higher rates of frothiness and foam durability after being whipped. It is used primarily in the production of confectionery, ready-made food and meat industries. Hen Egg Albumin Powder High Gel was obtained by elimination of glucose, drying the liquid protein of chicken egg and pasteurization. Hen Egg Lysozyme Chloride Powder was obtained by isolation of the enzyme from the liquid protein of chicken egg, drying and pasteurization. It is a natural preservative that can be used for preservation of food products.